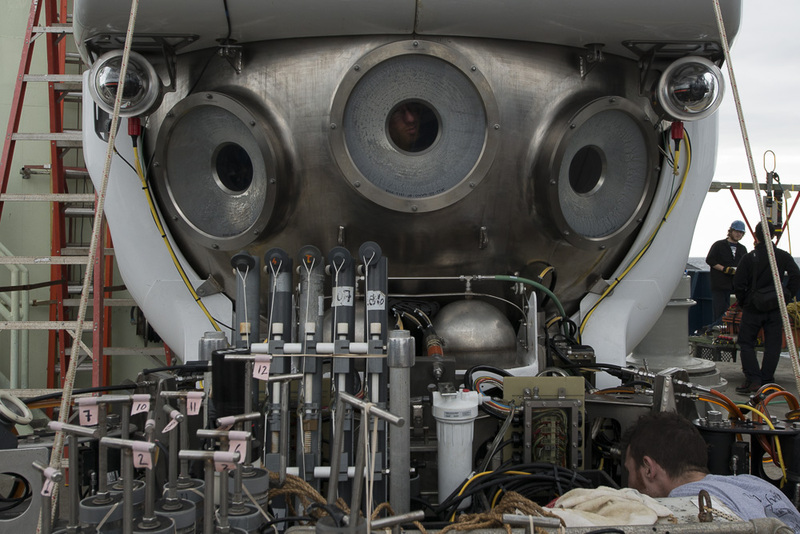 Alvin, the nation’s only deep-sea research submarine, took its first scientific dive yesterday [March 15] after a 39-month hiatus and a major overhaul that dramatically upgraded the sub. 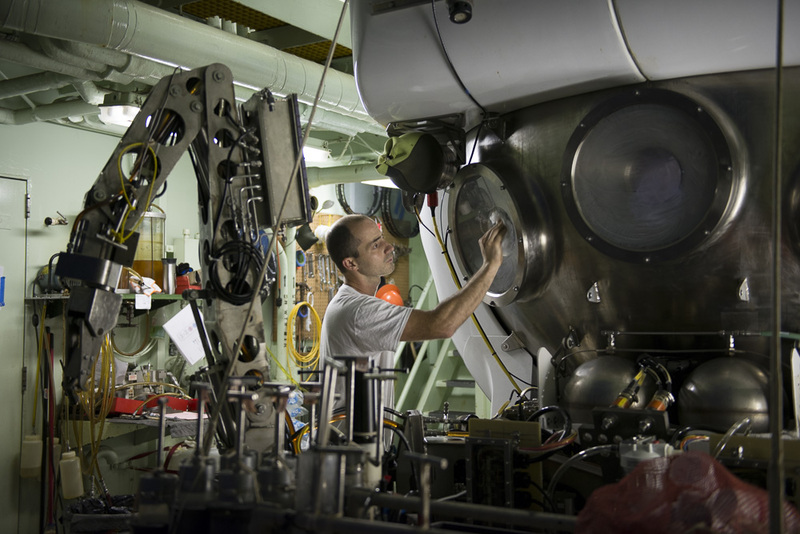 Aboard the research vessel Atlantis, scientists and crew had to wait a few more hours for Alvin to return to the surface from its first test to learn how things went. 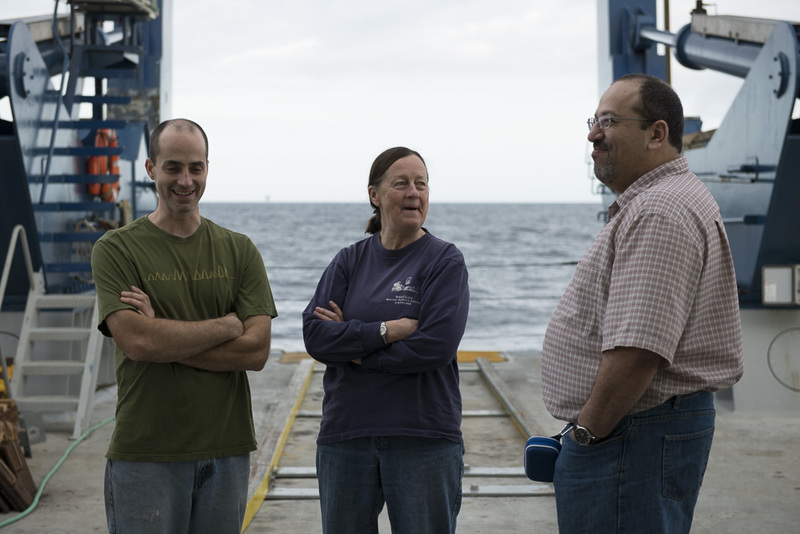 When Woods Hole Oceanographic Institution scientist Susan Humphris emerged from the sub and walked down a gangplank to the deck, they got their answer before she had uttered a single word. “I was waiting for that smile,” said George Luther, a University of Delaware scientist and veteran Alvin diver. “I haven’t seen Susan smile like that in five years,” said Chris German, chief scientist for the National Deep Submergence Facility at WHOI. Perhaps not coincidentally, five years is about how long Humphris acted as lead scientist supervising the Alvin upgrade. 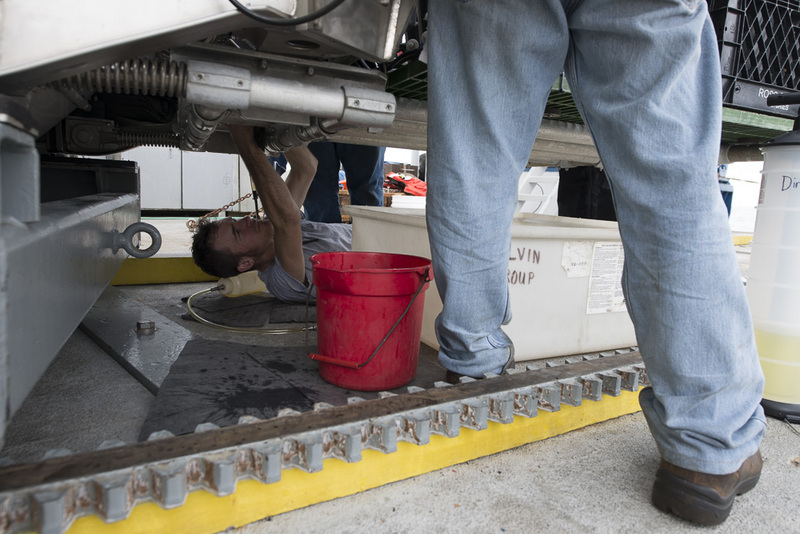 The new Alvin rolled out of its hangar aboard Atlantis early yesterday morning and was secured to a custom-made, 5-inch-diameter rope and lifted over the stern by the ship’s newly reinforced A-frame. As the body of the sub sank beneath the surface, leaving only its bright orange sail above water, Atlantis moved away and Alvin receded in the distance. Alvin Expedition Leader Bruce Strickrott and pilot-in-training Jefferson Grau lingered at the edge of the fantail as waves splashed against the tiny orange dot in the distance until it finally disappeared below the surface just before 10:30 a.m.
Because the first dive site was only 320 meters deep, the sub was on the bottom about 12 minutes later, and Humphris, Alvin pilot Bob Waters, and pilot-in-training Nathan Brown spent the next five hours doing the undersea equivalent of a road test. The full report from Humphris came just after dinner, starting with the view from Alvin‘s new, larger personnel sphere. The inside of the sub is in some ways similar—you’ll see a lot of the same knobs and buttons—but the layout is somewhat different,” Humphris said. “During the dive, the ability for observers to see forward as well as to see out the side viewports really changes the way you can use the sub. To prove it to myself, I spent about five minutes on one transit just looking out one of the side viewports to remember what it used to be like, and I’ll tell you, the new, much larger forward-looking viewports are a huge, huge improvement. It’s just easier because you can all see the same thing. There’s none of this, ‘Could you turn the sub around so I can see something again?’ or ‘Could you let me crawl in your seat and show you what I want to sample?’ There’s none of that. The other thing that has really changed is we all used to sit on a flat platform, and now there are sculpted seats/benches that are much more comfortable. It allows you to lean and look out the front viewport or turn around sideways and look out the side viewport. It allows you many more positions to sit and make observations. At first, I didn’t think the sphere was that much bigger, but you could actually stand up in it for a few minutes. There are a number of cameras on the vehicle, more than there used to be, and we’ve gone to high-definition cameras and LED lights. We did a large number of tests with the lights and cameras. The cameras above viewports are incredibly good. They have a wide pan-and-tilt, a very good zoom, very clear pictures. The lighting seems to be extremely good for those images. I had thought we might have issues potentially with the sub’s manipulator arms getting in the way of the forward viewports or cameras. It turns out to be very easy to deal with that. That turns out not to be a problem. We got some really good images of anemones, corals, a really strange-looking crab with red-and-white striped legs, some fishes. So you’ll be able to get a look at them. I was really impressed. The downward-looking camera, which is a high-resolution camera that can take video or stills, those images are fantastic. We tested them at various heights from the bottom. In some angles, the edge of the sub’s body can be seen in the image, but that is a minor thing that can be adjusted. I’m not a skilled viewer of imagery. It’ll be interesting to get feedback on the imagery and lighting and if you can see ways we can improve it. In tomorrow’s dispatch, we hope to show you some of the imagery captured by Alvin‘s new camera systems. Humphris went on to describe tests of the Alvin‘s new command-and-control features that automatically maintain the sub’s position, attitude, or heading. Previously, pilots could only control these manually, and pilot Bob Waters was feeling out these systems for the first time. “Overall I think the new command-and-control systems make it easier for pilots to manage the sub, so they can participate more in the dive, rather than just drive,” Humphris said. 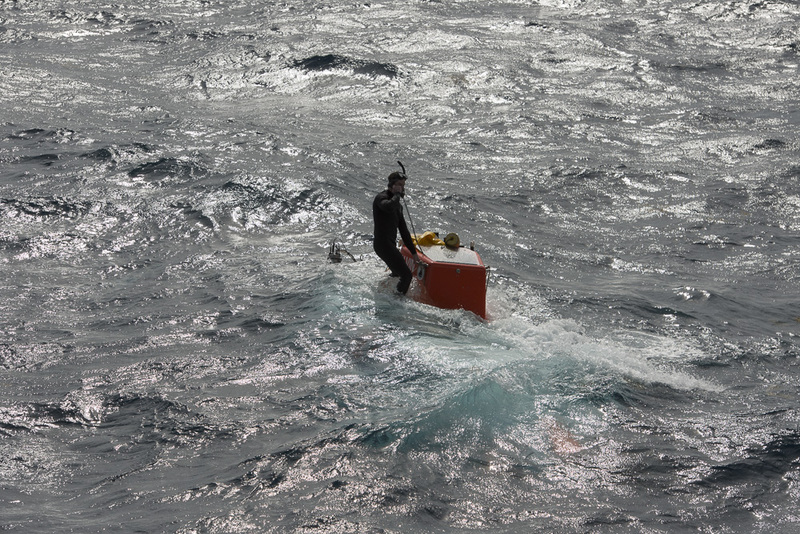 The team tested the sub’s navigation system and forward-looking sonar, then did a speed trial. They made a transit along the seafloor at speeds ranging from one-half knot to slightly more than 1 knot and recorded the power needed to do both. They found the vehicle is capable of making long, fast transits, but that it consumes power faster. As Waters explained it, if you want to travel a long way in the sub, then the most energy-efficient way is to go slowly, but if you want to get there in a hurry, you can do that, too. 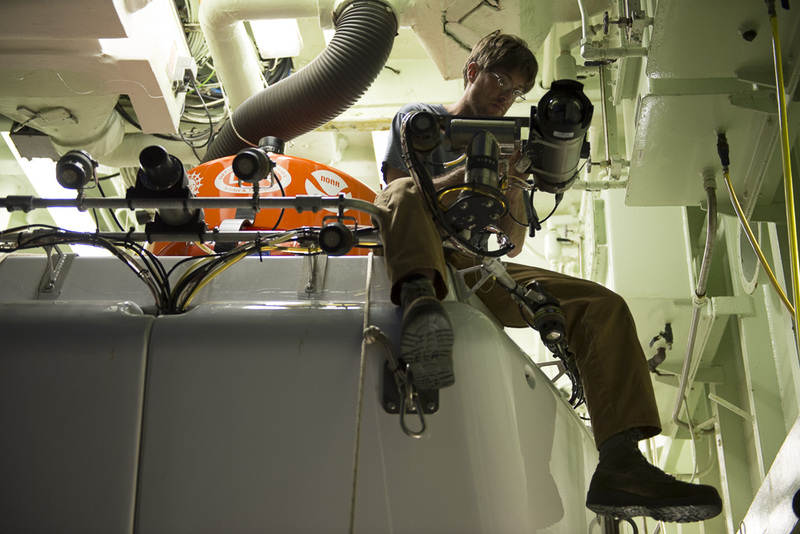 Finally, the team tested Alvin‘s manipulator arms, which were made more flexible to give them greater reach and also to allow them to be moved out of the way of the new forward viewports to improve visibility. 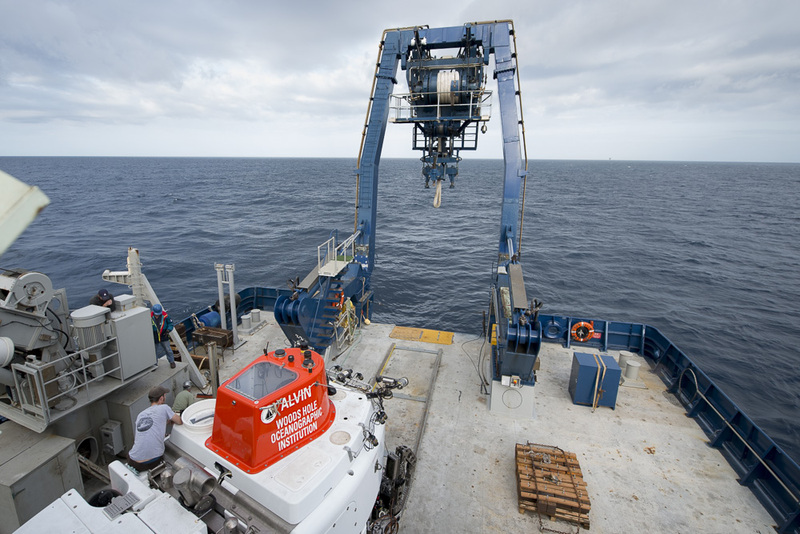 Even though a glitch prevented the portside arm’s gripper from closing fully, Waters took six cores of seafloor sediments in an efficient 15 minutes. The arms also passed a test in which they tripped wires on seawater sample bottles. “It was a busy dive, but a really positive beginning,” Humphris said.